Better bus service could mean less traffic and fewer delays along Route 29 in Montgomery County, say transportation officials. But that may only happen if buses get their own lanes. BRT in Alexandria opened three years ago. Photo by BeyondDC on Flickr. For nearly a decade, the county has discussed creating a network of bus rapid transit lines. County Executive Ike Leggett wants to build the first one, along Route 29 (Colesville Road/Columbia Pike) between Silver Spring and Burtonsville, by 2020. While BRT has been successful in other cities around the country, the 11-mile line will help prove that it can work here. The county and the Maryland Department of Transportation just finished a study looking at what a bus rapid transit line could do if it were built, and what would happen if nothing got built at all. Here's what they found. BRT offers many features you'd expect from a train: large, covered stations, fare machines where you pay before getting on, and special traffic signals to let buses pass ahead of other vehicles. The county envisions thirteen stops along Route 29, with buses running in both directions every six minutes between 5 am and midnight, seven days a week. The most important feature of BRT are dedicated lanes for buses, which allow buses to speed past traffic, making the service fast and reliable. The county and state are looking at three alternative ways to create dedicated lanes for all buses (including existing local and commuter buses) as well as carpools. Depending on the alternative, buses would use the right-hand lane along sections of Route 29 south of New Hampshire Avenue, where it's more of a city street. North of New Hampshire Avenue, where Route 29 becomes more of a freeway, buses would either travel on the shoulder or in the median, where new lanes would be built. Estimates say the project would cost between $79 and $136 million to build. Meanwhile, the county is planning to build a sort of "temporary" BRT line with some of those features that could cost about $67 million. It recently received a federal grant to help pay for it. Map of the proposed Route 29 BRT line from Montgomery County. It could reduce travel times, including for drivers. 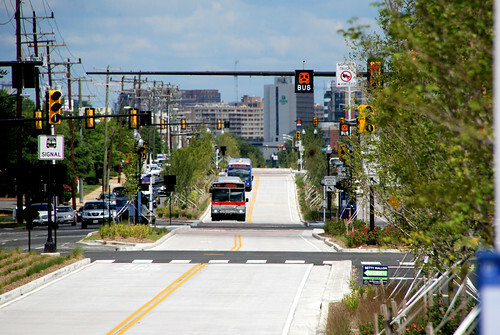 Today, a bus trip from Burtonsville to Silver Spring can take nearly an hour in the morning. The study found that the same trip on BRT could take as little as 29 minutes, making it even faster than driving. In some cases, car trips would be shorter as well. It could reduce congestion. The study found that in all three cases, the amount of driving along Route 29 would actually decrease. Today, many people may choose to drive because the current bus trip is slow and circuitous. With a new, faster option, some drivers may choose to use transit, freeing up space on the road for those who still choose to drive. It could double transit use in East County. Route 29 is one of the region's busiest bus corridors. Today, people take 15,000 trips through the area each day on Metrobus, Ride On, or MTA commuter buses. The study estimates that another 16,000 to 18,000 would ride BRT, while existing bus service would see new riders as well. It could increase access to jobs and economic opportunity. The study finds that BRT could "provide opportunities for low-income and minority populations to enhance their quality of life through improved transportation and employment options." Research shows that one of the biggest barriers to getting a job is the lack of safe, reliable transportation to that job. The study finds that BRT could allow East County residents to reach more jobs within 45 minutes than they can today. Transit might also draw more private investment to areas like downtown Silver Spring and White Oak, putting more jobs within close reach. It could support Montgomery County's nighttime economy. One of the county's main priorities has been promoting nightlife in downtown areas like Silver Spring to encourage more people to live or work here, but the buses are often less frequent or don't run at all outside of rush hour. The BRT study finds that many of the proposed BRT stations, like Fenton Street, Burnt Mills, and Stewart Lane will actually be busier during evenings and weekends than during rush hour. These stations are in shopping and entertainment areas, like downtown Silver Spring and White Oak, that are both popular hangouts and have lots of late-night service and retail jobs. This study looks at what would happen if Montgomery County and Maryland built bus rapid transit with dedicated lanes for buses. Creating bus lanes can be expensive depending on how you do them. And since Montgomery County first proposed BRT several years ago, there's been a lot of pushback from some neighbors who are worried about car traffic. But all of the benefits BRT could bring East County are less likely to happen without dedicated lanes that make buses faster, more frequent, and more reliable. After all, a bus that sits in traffic is just a bus. You've got a number of chances to offer your thoughts on this project. The county and state are taking public comments on this study through February 20. On February 7, the County Council will have a public hearing about whether to provide money to build bus rapid transit, and you can sign up to testify here. And there will be public meetings later this spring to talk even more.